« Monarchs at 10,000 feet! Patzcuaro in Michoacan, a fantastically well-preserved colonial town, mostly dedicated to tourism, but still incredibly charming! 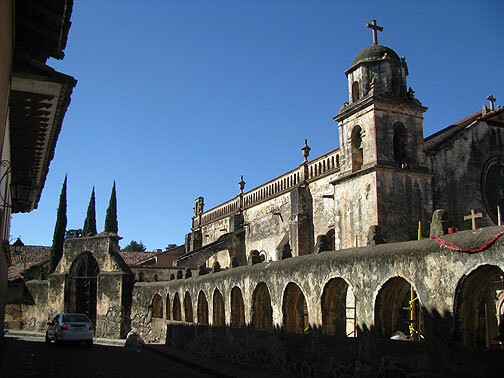 Adriana introduced me to a favorite Mexican pastime: puebleando… in English it might be “towning;” essentially driving from town to town in search of the serendipitous and fascinating, the cultural specialties, the curious hybrids produced by centuries of Mexican life… what fun! 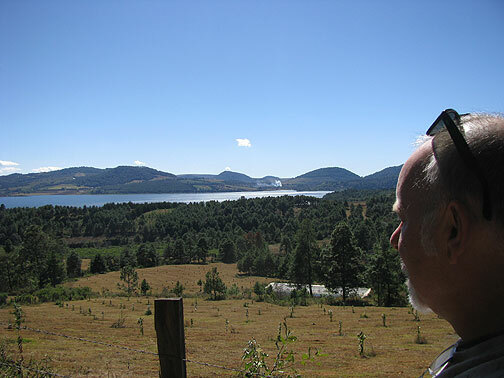 View across lake from TzinTzunTzan's ruins. And the state of Michoacan is a great place to do it! The countryside is stunning, with dozens of old volcanoes and long ridges surrounding breathtaking valleys and providing long vistas at every turn. 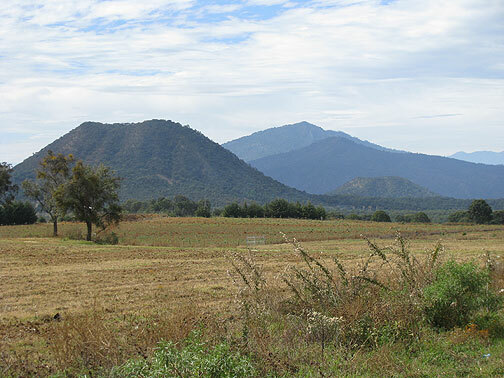 There are a lot of great lakes in this state too, and we had the pleasure of taking the “Ruta de Don Quiroga” through the town of Tzintzuntzan, where the Purepecha people were the dominant culture long ago. 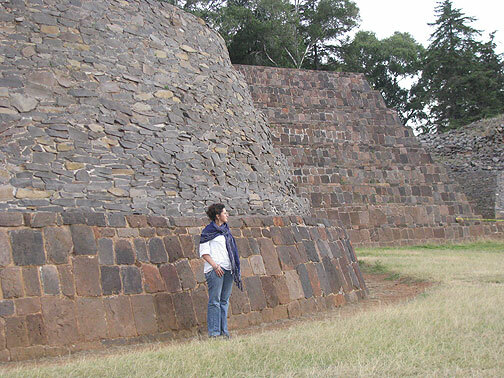 Adriana at the Purepecha ruins above Tzintzuntzan. 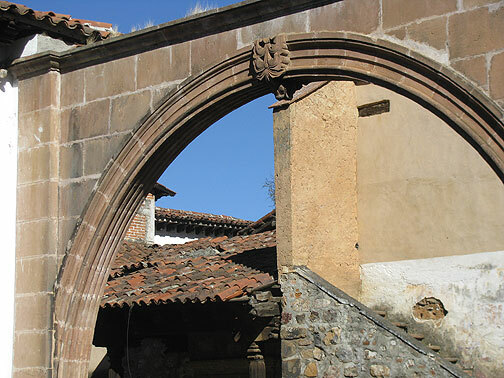 A major ruin sits above the town, but Don Quiroga is honored all around the lake for having encouraged each local village to specialize in its own type of product, a basic division of labor in the region. Somehow this centuries-old scheme has prevented both heavy industrialization in the area and also kept the lake or local towns from being taken over by wealthy locals or tourism entirely. One of the great pleasures of travelling with Adriana is her propensity to chat up everyone we meet. 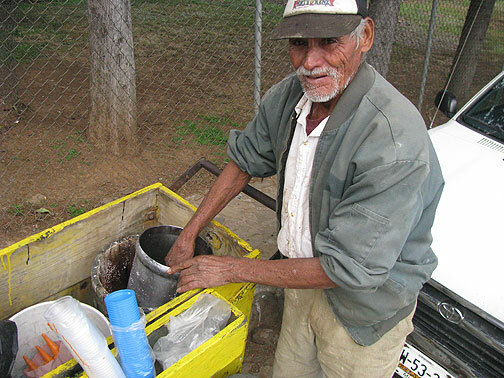 This guy is 75 years old and has been making and selling his own ice cream for 50 years! Mexico is a dynamic political society. 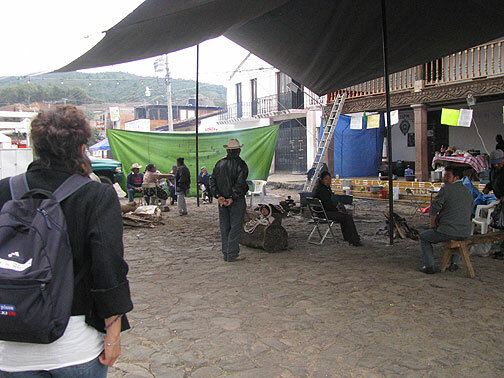 Here locals in Tzintzuntzan had set up an encampment in front of the town hall in an attempt to force the resignation of the Treasurer, who they claimed had embezzled funds and was completely corrupt. 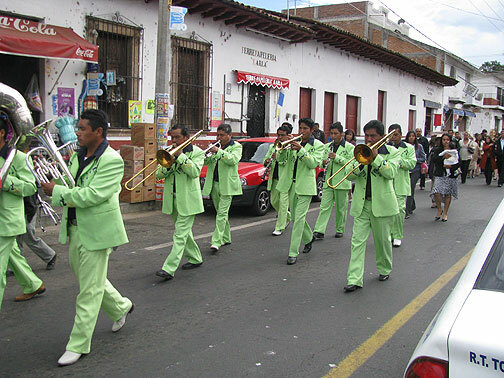 While we were having lunch in Tzintzuntzan's tiny zocalo a wedding marched by with this rockin' band! In Tzintzuntzan there is also a monastery that originally had 33 olive trees planted (to represent Jesus Christ’s 33 years). The trees that are still standing are absolutely haunting, each one over 400 years old. 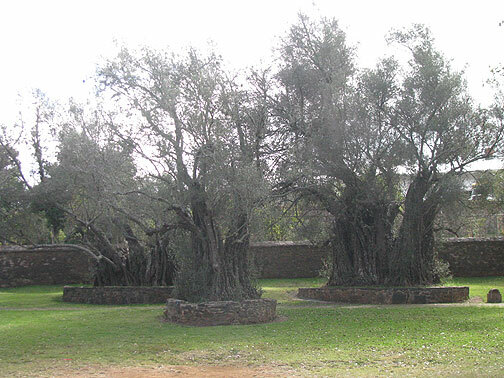 400 year old olive trees in Tzintzuntzan. 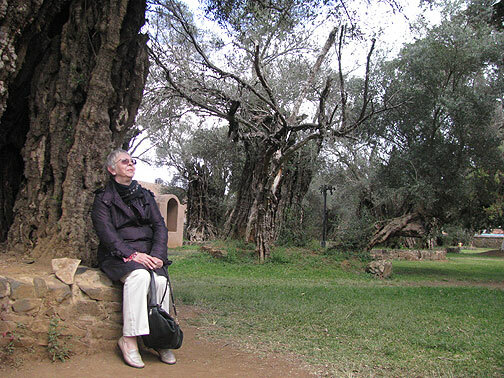 My mother shares a moment with the 400-year-old olive trees of Tzintzuntzan. After a nice 3 hours in Tzintzuntzan we continued south along the Ruta de Don Quiroga to Patzcuaro, a spectacularly beautiful town full of vitality. 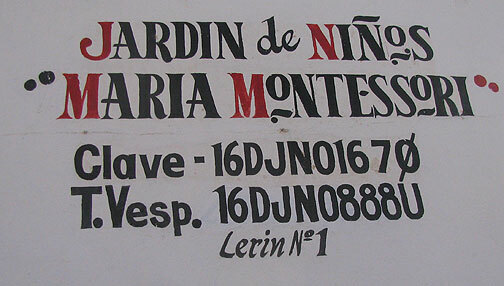 The town maintains its historic look as best it can, and the entire center uses only the same familiar fonts in black and red to indicate what stores or businesses are where. Even supermarkets and farmacias are disguised by the unchanging facades and signage. 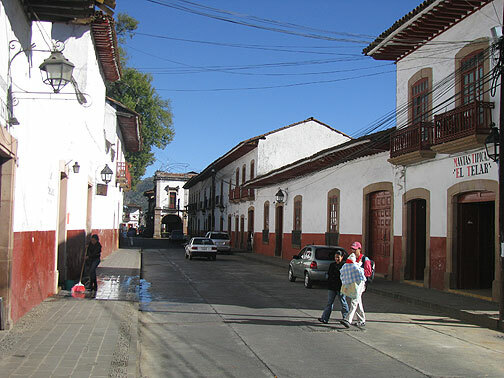 This is the standard look of central Patzcuaro. The Plaza de Don Quiroga is at the end of the street in this photo, and you can see the signage over the door to the right. Even the local Montessori school used the same signage. The town is gorgeous, full of Calvino-style “Invisible Cities” architectural moments. 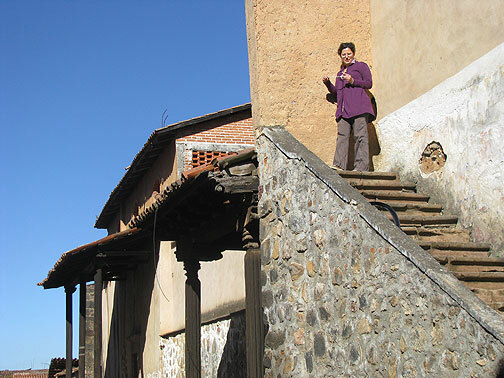 Adriana on a stairway to nowhere in Patzcuaro! Arches and angles at every turn! 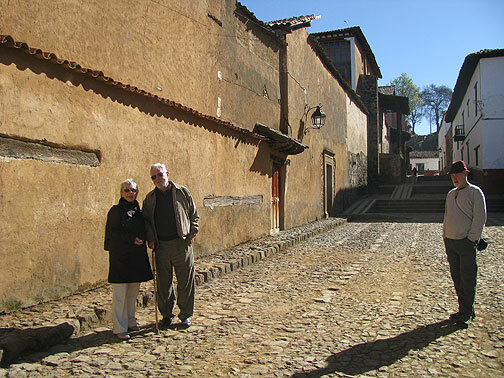 My parents and me lurking off to the side in Patzcuaro... what colors! This is also in Patzcuaro. 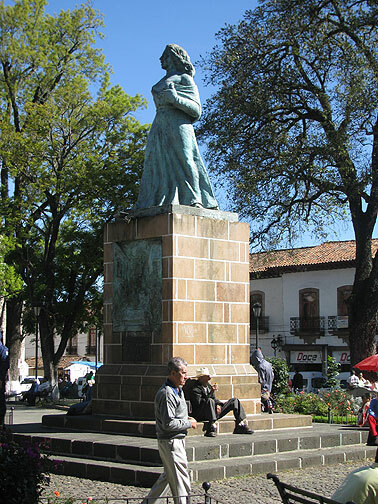 Local feminists erected this statue to Gertrudis Bocanegra in the 1970s. She was a hero of the Mexican Revolution, put to death by Spanish soldiers in 1818 when she refused to divulge any names of the insurgents. 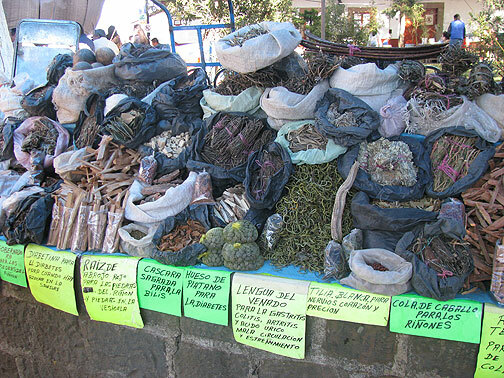 Outside a town cathedral, a busy market sold many tourist items, but for those in pain or ill after a visit to church, there were a couple of competing medicinal herb booths. 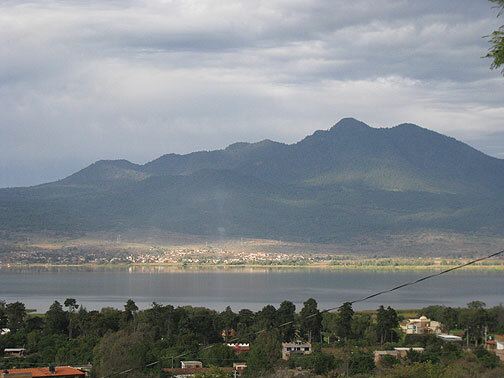 After we spent the night in Patzcuaro and part of the following morning, we took off to a lake and town called Zirahuen, which several people had recommended to us. As we approached we saw signs indicating it was a federal protective reserve of some sort, which corresponded to its reputation of being much cleaner and more beautiful than a lot of the towns or the island town in the big lake near Patzcuaro. We rolled down through pungent pine forests under crisp blue skies, and stopped to take a panoramic view of the lake. Adriana caught me gazing at beautiful Lake Zirahuen. 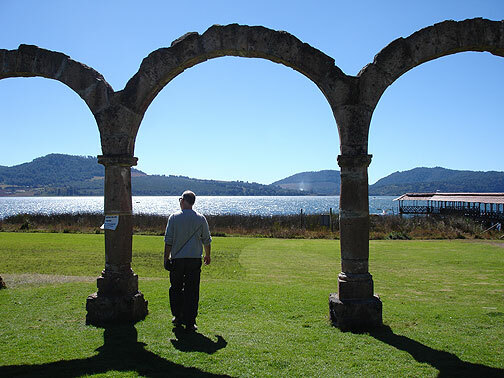 Apparently an old hacienda or monastery used to sit at the lake shore, but all that's left are these arches. A few dozen yards to my right in this photo is a pier stretching out into the lake for boat trips, and a weird cluster of fish restaurants and artesania booths. 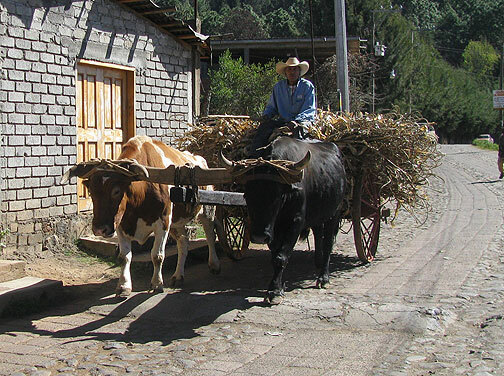 Oxcart on hand-paved road between Zirahuen and Santa Clara del Cobre. 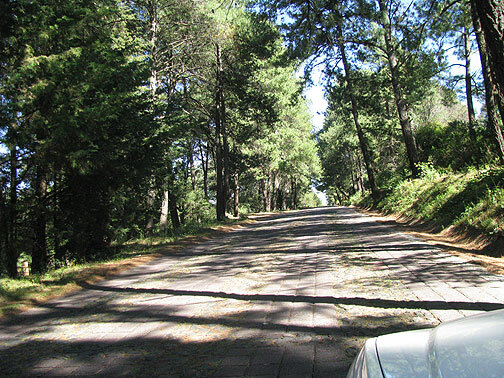 Different cobblestones pave the road from Zirahuen to Santa Clara del Cobre. Shortly before we reached Santa Clara it gave way to a gravel road for about 2 km. 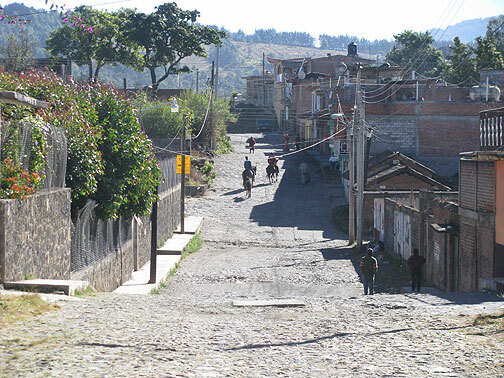 In Santa Clara del Cobre, the town is mostly dedicated to what its name would indicate: copper. There are countless small vendors of copper kitchenware, as well as vases, jewelry, and all manner of useful items. There were a couple of small factories in town churning it all out, another remnant of Don Quiroga’s original division of labor in this region. In the town’s center, a small market yielded a few nice purchases, and in the gazebo the town hung a giant copper pot, honoring its source of sustenance. 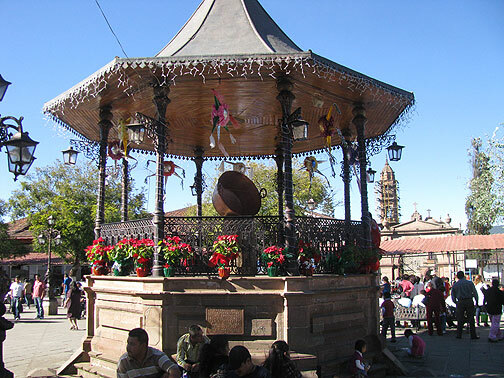 The Great Copper Pot of Santa Clara del Cobre. From Santa Clara we drove about 4 hours across Michoacan to get to our hotel that night, Hacienda San Cayetano in Zitacuaro. We had a great visit there too, but that’s for the next post. In my next post I’ll show the amazing Monarch butterfly reserve we visited, which meant riding horses up a nearly vertical incline for about 3,500 or 4,000 feet! My parents, age 72 and 77, were not ready for THAT, but my dad made it all the way, and my mom made it most of the way, though I think they were left with permanent scars! 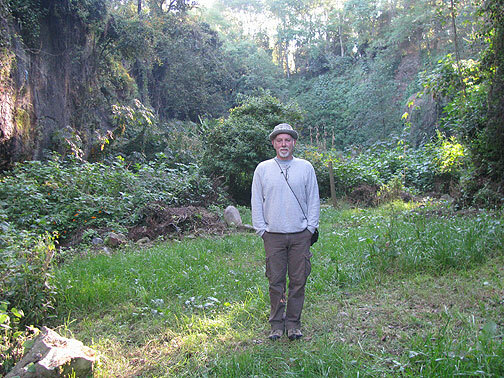 At the river's edge on the grounds of Hacienda San Cayetano just before leaving for the butterfly reserves. Great memories for me. I was born in Patzcuaro and immigrated to chapel hill NC. Your pics made feel the jrge to go back and revisit my early steps. Thnx.